The rumblings, or at least the hopes, are that Wake Forest football will return to its first bowl game since the 2011-12 season. And why not? It is the third year under head coach Dave Clawson, who has overseen a transition to more talented and more athletic players. It is also quarterback John Wolford’s third year in the program. With 600 pass attempts in his career, Wolford has the experience and knowledge of the playbook to be a poised quarterback. He’s thrown 25 interceptions to 21 touchdowns in his career, but he also has not had a lot of talent surrounding him. Wolford has been plagued by an offensive line that struggled to protect him, and particularly in his freshman year, receivers who could not consistently get open or make contested catches. Both of those situations should improve this year, with Clawson praising the team’s work in the weight room. A stronger offensive line should translate to one that isn’t overwhelmed as often as it used to be. 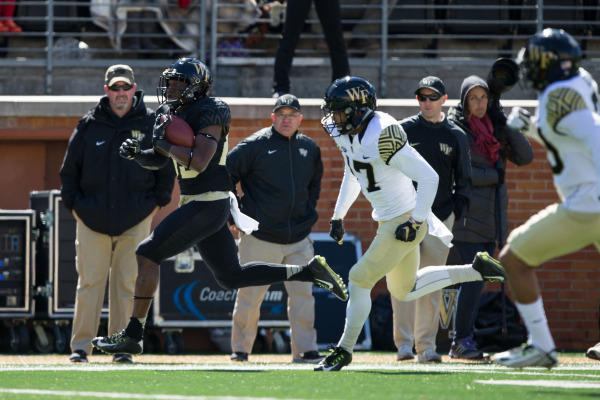 And perhaps the most exciting part about the Demon Deacon’s offense is the receivers. Many of them showed promise last year, and displayed progress in the spring game. 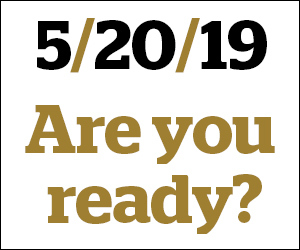 That includes senior six-foot, 190 pound senior Jalen Latter, who converted to wide receiver this spring and showed off his catching ability by pulling in a 17-yard touchdown pass from Wolford with his right hand in the first quarter of Wake Forest’s spring game on April 9. Don’t forget Chuck Wade. a sophomore receiver who caught 33 passes as freshman and showed off his speed he when turned a four-yard pass into a 73-yard touchdown. Both are plays that might not have been made the past two seasons. Wolford also clearly demonstrated that he is still the better passer than Kendall Hinton, who went 16-of-31 for 182 yards in the spring game. Wolford even excelled in the spring game without his best receiver, Cortez Lewis, who led the team in receptions and yards but missed the game due to a foot injury. There are also reasons why the team might not make it six wins for a bowl game, though. The defense, which ranked No. 38 in yards allowed in 2015, will be without two of its best players, Brandon Chubb and Hunter Williams. Both players graduated, and the All-ACC first-team Chubb will be particularly difficult to replace. It will be interesting to see how the Deacs defense will perform after losing two of their leaders and most important players. Additionally, while improved, the offensive line still did not show it could run block effectively in the spring game. Collectively, Team Gold and Team Black averaged less than three yards per carry. Although Tyler Bell’s five-yard, pile-moving touchdown run was a positive. This is a team after all that two years ago was one of the worst rushing teams in the entire FBS. Nonetheless, the program is encouraged by the improved depth of the whole team. That should help fill the holes at linebacker. And with a home schedule of Tulane, Delaware, Syracuse, Army, Virginia, Clemson and Boston College, it is feasible for the Demon Deacons to have a winning record at BB&T Field. One thing is for certain, though, Wake Forest fans are ready to see one of their revenue sports teams back in postseason play.